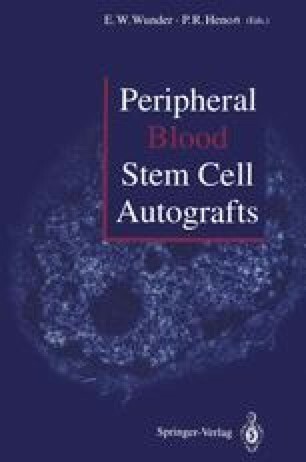 The use of peripheral blood stem cells (PBSC) to support hematopoietic reconstitution after high-dose chemotherapy is now well established [1–4]. A variety of stimuli are capable of transiently mobilizing large numbers of progenitors into the peripheral blood rendering them accessible for harvest by repetitive leukapheresis. In contrast to stem cells collected via leukapheresis in the steady-state condition or from bone marrow harvest, mobilized PBSC have clearly shortened the recovery time of both granulocytes and platelets after high-dose myeloablative therapy [5–7].